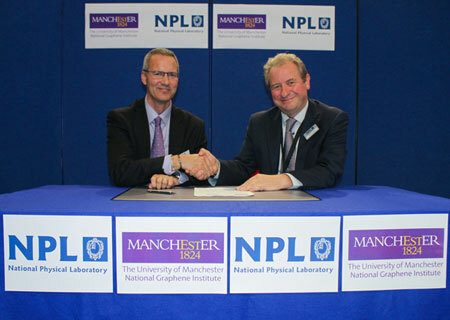 (Nanowerk News) The National Physical Laboratory (NPL) and The University of Manchester have signed a memorandum of understanding to help move the potential benefits of graphene closer to practical use, by accelerating the commercialisation of the remarkable 2D material. This landmark agreement will see two world-leading organisations work together on the development of graphene metrology, characterisation and standards vital to industry uptake, with a view to establishing a Joint Centre of Excellence. This will see the UK become a leading authority on graphene standards. The agreement was signed at NPL's Graphene & 2-D Materials Conference (12-13 November 2014) which focused on how to take the material from research to real-world applications, and included presentations from IBM, Nokia and the US Naval Research Laboratory. James Baker, Business Director at the National Graphene Institute at The University of Manchester, and Rhys Lewis, Head of Time, Quantum & Electromagnetics Division at NPL, signing the memorandum of understanding. Graphene, the world's first 2D material, has many extraordinary properties and characteristics which are either unique or surpass those of other materials. It possesses superior mechanical stiffness, strength and elasticity, electrical and thermal conductivity. It is optically active, chemically inert and impermeable to gases. The possession of all of these properties in a single material makes graphene a potentially disruptive technology in sectors like optoelectronics, flexible electronics, bioelectric devices, energy storage and ultrafiltration. There are many early adopters of graphene, but without standardisation it is difficult for industry to be assured of the quality and properties of the material, and for graphene to be used to its full potential. Although achieving international standardisation is a key enabler for industry in any area, the process can take many years. NPL and The University of Manchester are seeking to address this gap in standardisation in the meantime and accelerate the development of graphene-enabled technology through the accurate metrology and characterisation of the material to improve the understanding of the properties of graphene and the ability to produce it in a reliable and repeatable way. Robin Hart, Director of Programmes at NPL, said: "With its many amazing properties, graphene has the ability to totally transform entire industries. Consumers and manufacturers at different stages of the supply chain must be confident that they get what is written on the tin. Introduction of metrology steps in the development and production chains will dramatically improve their efficiency and ensure that the government and business investment in graphene technology is used in the most effective way. James Baker, Business Director at the National Graphene Institute at The University of Manchester, said: "With this new partnership The University of Manchester and NPL are showing joint determination to lead the way in graphene applications. Industry leaders need to be confident in the material they are dealing with. By working with academics at The University of Manchester and at the National Graphene Institute, companies can be confident in approaching graphene applications with the best possible understanding through comprehensive standards , characterisation and testing. "The metrology expertise based at NPL, paired with the world-class academics, state-of-the-art equipment and facilities at The University of Manchester and the National Graphene Institute allows for viable graphene-based products to come the marketplace sooner."